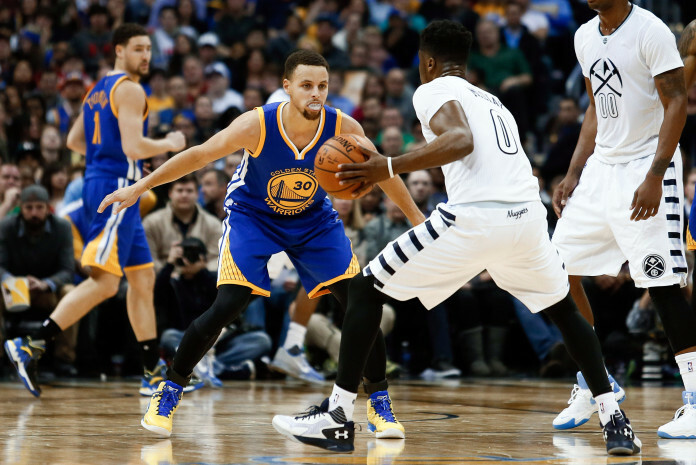 What does the Nuggets win over the Warriors really mean? 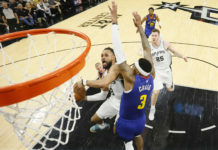 The Denver Nuggets beat the Golden State Warriors on Wednesday night to hand the defending champs just their third loss of the season. But what does that win really mean? The short and blunt answer is nothing; it means absolutely nothing. The glass-half-full answer: The win can mean a lot. I have said it before, and will continue to do so throughout the season, but this is a rebuild. Not only is it a rebuild; it has only just begun. Lets get this negativity out the way, first. In the short term, we probably just witnessed the Nuggets’ peak, and we’re not even half way through the season. They will now be on a short list of teams that beat both the 72-10 Chicago Bulls and this (yet to be determined) Golden State Warriors team. And in all likelihood, they could very well end up being the only franchise to accomplish such a feat; the Bulls play in the East and lost only one of those ten games to another Western Conference team — keep that in mind; it’ll earn you a beer during some barstool trivia. Lets all be honest, though, that win is not going to spark a run that will result in a favorable playoff matchup. Still, there’s a possibility that the Nuggets win over the Warriors could be huge. Not, like, go on a run to make a playoff push huge, but it can start something. For Michael Malone’s sake, I hope it starts to make the team believe in themselves. Malone has complained about effort, amongst other things, but a win like this one will certainly give a young team some confidence, and with confidence comes effort. The Nuggets will need good news about Jusuf Nurkic, because he has provided a spark, and they need a rim protecter, or at least someone who resembles one. The Nuggets have not been able to “punch back” after they’ve taken one on the nose, but Nurk helps prevent that first blow. Something the team and NBA fans get when they watch the Warriors play is how to play today’s game to perfection. It’s no longer a trend to play “small ball”; it’s just the way it is. I really pay no attention to the term “small ball” because I see a team playing just as that: a team. That is something I know Malone wants to achieve: work together on BOTH ends of the floor, and then you will be successful. Save your “what about Steph Curry” tweets; I get it, but there’s a larger point here. 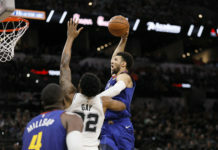 Michael Malone said after the game that the team set a goal of finishing this eight-game home stand with a record of 6-2; the win over Curry and crew makes that achievable. They’re still in an uphill battle with the Heat, Pacers, Thunder, Grizzlies, Pistons and Hawks left before they hit the road, but the team can win four of the next six if they play the way they did against the Warriors. That’s a big “if” with this Nuggets team, though. 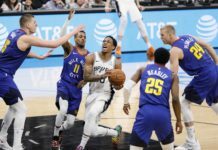 As we’ve seen for years, this team always seems to play up to the competition when a powerhouse is on the docket, but they also play down to the competition with an inferior opponent. It’s a new year, and I’m a new optimistic kind of a guy, so I think they can finish 6-2, with wins over the Heat, Pacers, Grizzlies and Pistons. I really want to remain positive, but I want it to be known that I cringed as I was trying to pick those wins.